REGGAE IS GOOD FOR YOU! Subscribe to BAA newsletter. Be first to know who and when will be on tour. News from Reggae music. They are only few of many Buxna friends. If you want us to support you, link us and get your place here. Buxna Agency trying to move forward, to work with talented people that no big comanies want to support. BA main mission still will be booking of Reggae artists and some other genres of music. BA concentrate to East European market, hardest market in Europe. Last few years we was doing market research and see great potential in Russia, Bielarussia, all Balkans....There is lot of open minded people who still dotn know that Reggae music is only Bob Marley and thats it. No artist want to go there. This people didnt saw good reggae show. When i was playing some modern, younger artist people there was, like... woow, great music, what is this? I told them, this is Reggae music. Answer was face that i didnt saw for long time, last time i saw face like this when Red Star Belgrade win Olimpic Marseille in finalle of Champions league, face that say: Noooo, dont joke with me, tell me really what is this. This is not reggae for sure. And on my play list was Dub Inc and after Anthony B. After this conference BA get mission, even that none ask for some. We come back from conference in St. Petersburg around April 25th and from May 1st we are working on huge educational project for 2018. Mission is to show to this people good Reggae festival. Idea is that around 4 artists different kind of reggae go on tour. One roots artist ( for example M. Rose ), one younger, energetic artist ( for example Anthony B ), we call this world reggae ( Dub Inc ) and maybe one dancehall artist. Now is coming part what new will BA do in future. 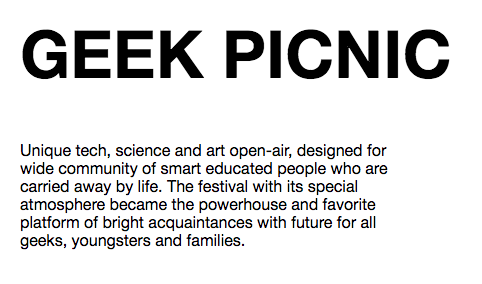 BA become partner with Geek Picnic festival. http://geek-picnic.me/about Group of entusiastic Russians decide to make this festival with same mission as BA have with reggae, only they say: lets promote new technoligy and to show to people that wotn have chance to see in their life, not even dream to buy it and have it. They do great job last 3 years. They travel all around world and they have big succes in lasst 3 years. Check more on their site. As we have same mission we join forces. So BA will from now also book Geek Picnic all around world. Then last, new thing that BA will do. Last few years we are interested in hologram. Now, finally product is finlised and BA will offer this product to open minded people and to people who have ambition, like new and original things. I would love that Reggae artist release next albums with this hologram app. Their fans will have option to have hologram of their favorite artist at home and non stop with him. For artists this product should be interesting coz it can be used to release new album. Who want to buy new album of some artist they will need to download some app, order cover/cardboard, ( all oniline ), pay it online and then they can download new album of theri favourite artist at their mobile phone, then put phone in this cover that they will get and when they press play..... miracle :), Favorite artist is in front of them and ..... Now, this is up to artist what he will record. he can record greetings, or even one song, part of live show.... imagination is limit. As we use to say: We dotn talk, we do. I hope now finally we wil do like this for real.